The disorder is a chronic inflammatory condition in which the airways develop increased responsiveness to various stimuli, characterized by bronchial hyper-responsiveness, inflammation, increased mucus production, and intermittent airway obstruction. The symptoms of asthma, which can range from mild to life threatening, can usually be controlled with a combination of drugs and lifestyle changes. Public attention in the developed world has recently focused on asthma because of its rapidly increasing prevalence, affecting up to one in four urban children. Susceptibility to asthma can be explained in part by genetic factors, but no clear pattern of inheritance has been found. Asthma is a complex disease that is influenced by multiple genetic, developmental, and environmental factors, which interact to produce the overall condition. An acute exacerbation of asthma is referred to colloquially as an asthma attack. The clinical hallmarks of an attack are shortness of breath (dyspnea) and wheezing, the latter "often being regarded as the sine qua non." A coughâ€”sometimes producing clear sputumâ€”may also be present. The onset is often sudden; there is a "sense of constriction" in the chest, breathing becomes difficult, and wheezing occurs (primarily upon expiration, but can be in both respiratory phases). Signs of an asthmatic episode are wheezing, rapid breathing (tachypnea), prolonged expiration, a rapid heart rate (tachycardia), rhonchous lung sounds (audible through a stethoscope), and over-inflation of the chest. During a serious asthma attack, the accessory muscles of respiration (sternocleidomastoid and scalene muscles of the neck) may be used, shown as in-drawing of tissues between the ribs and above the sternum and clavicles, and the presence of a paradoxical pulse (a pulse that is weaker during inhalation and stronger during exhalation). During very severe attacks, an asthma sufferer can turn blue from lack of oxygen, and can experience chest pain or even loss of consciousness. 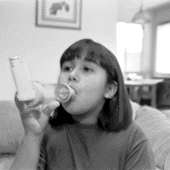 Severe asthma attacks may lead to respiratory arrest and death. 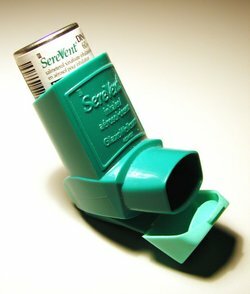 Despite the severity of symptoms during an asthmatic episode, between attacks an asthmatic may show few signs of the disease. Objective. To evaluate the longitudinal impact of asthma specialist care on the risk of emergency department (ED) visits and hospitalization for asthma. Despite increased scientific knowledge about asthma and improved therapeutic options, the disease continues to cause significant morbidity and mortality. The role of selenium, zinc and antioxidant vitamin supplementation in the treatment of bronchial asthma: adjuvant therapy or not? In the last few years, nutrition has represented an important conditioning factor of many cardiovascular, gastrointestinal and pulmonary chronic diseases.